For the living British princess see Anne, Princess Royal. For the British Queen see Anne, Queen of Great Britain. Princess Anne in c. 1639. Anne of England (17 March 1637 – 5 November 1640) was the daughter of King Charles I and his wife, Henrietta Maria of France. She was one of the couple's three children to die in childhood. 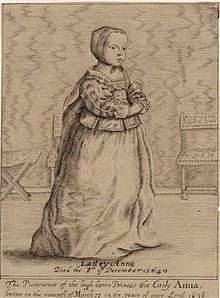 Anne was born on 17 March 1637 at St. James's Palace, the seventh child and third daughter of King Charles I of England and his queen, Henrietta Maria of France. Her siblings were, in order of birth: Charles James, Duke of Rothesay and Cornwall (13 May 1629); the future Charles II of England; Mary, Princess Royal and future Princess of Orange; the future James II of England and Elizabeth of England. Anne was baptised an Anglican at St. James's Palace on 30 March, by William Laud, the Anglican Bishop of London. Anne only lived to see the birth of two siblings: the stillborn Catherine (29 June 1639) and Henry Stuart, Duke of Gloucester. She died before the birth of her sister, Princess Henrietta of England, who married Philippe I, Duke of Orléans and had four children by him. Anne was a sickly child, which is obvious in this engraving of her. She was frail and slightly deformed. Anne became ill with tuberculosis, a disease which would later kill her more famous sister Elizabeth. Aged just three, Anne died at Richmond Palace. She was buried in Westminster Abbey, next to her brother Charles James. ↑ Some sources place her death on this day, e.g. Chester, Joseph Lemuel (editor) (1876). The Marriage, Baptismal, and Burial Registers of the Collegiate Church or Abbey of St. Peter, Westminster. Page 134. London: Harleian Society. 1 2 3 Weir 1996, p. 253. ↑ Anonymous (c. 1640). "The Effigies of Lady Anna". The British Museum. britishmuseum.org. Retrieved March 3, 2012. ↑ He also baptised all of her siblings. ↑ "Princess Elizabeth, 1635 - 1650 and Princess Anne, 1637 - 1640. Daughters of Charles I". National Galleries of Scotland. nationalgalleries.org. Retrieved July 8, 2016. 1 2 Louda & Maclagan 1999, p. 27. 1 2 Louda & Maclagan 1999, p. 50. 1 2 3 4 Louda & Maclagan 1999, p. 140. This article is issued from Wikipedia - version of the 7/22/2016. The text is available under the Creative Commons Attribution/Share Alike but additional terms may apply for the media files.